The uranium conversion plant reported a valve was leaking between 6 and 8 p.m. No workers were affected and no chemicals were released beyond the plant. The facility is currently shut down. Honeywell’s Peter Dalpe said the length of the closure will depend on the inspection and discussions with the NRC. Officials expect the investigation to last at least a week. Dalpe said Honeywell is cooperating fully with the NRC inspection and is committed to the safe operation of its facilities. According to Dalpe, there have been 3 UF6 leaks at the plant since 2003, including one last October. The NRC determined Honeywell did not classify the October leak properly. Plant personnel classified the leak as a plant emergency rather than a more serious plant alert, which requires the company to notify the NRC of the incident sooner. The plant has 3 emergency levels, the lowest is plant emergency, second is plant alert, and highest is site area emergency.This weekend’s leak was classified as a plant emergency. The Nuclear Regulatory Commission has ordered Honeywell, Inc. to administer new policies for reporting employee and safety concerns. 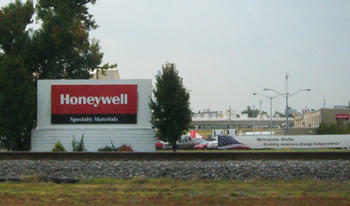 United Steelworkers Local 7-669 officials say they’re concerned by the arrival this morning of salaried and contract employees during contract talks at Honeywell’s Metropolis facility.